By which I obviously mean a nice, refreshing drink of water because it’s the middle of the workday, gosh. This is rude. This is so rude. So, so rude. Gnomes get a lot of hate, and it’s for one reason: people are intimidated by us. We’re half the size of any other race, at most, but we’re just as powerful as anyone else in Azeroth. Have you ever met a Gnome Warrior, standing in front of a raid boss, fearlessly taking hits? Or a Rogue, stabbing things (admittedly) in the ankle until they’re dead? There is no stopping us. So I understand why you might not like us. You’re afraid and you’re displacing that feeling into dislike for us. People come in all shapes and sizes, and you don’t have to feel inadequate because someone who’s physically smaller than you can be just as powerful as you are. Please learn to accept yourself and in so doing learn to accept others. I accept you for who you are, and I hope that, in time, you can learn to accept me despite the fact that I’m different. Q4TQ: best bar in the game? 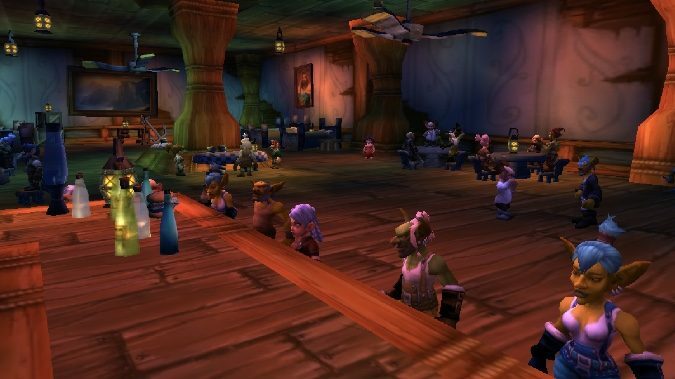 There’s no competition for Fizzle and Pozzik’s Speedbarge bar, where a crowd of Goblins and Gnomes prove on a daily basis that cross-faction cooperation is possible. (Despite the occasional bar fight.) We could all learn from their example. QftQ: What do you think the Pandaren faction leaders have been doing during the events of Before the Storm and Battle for Azeroth? Follow up Q: Will we ever get a resolution to their story? Blizzard has a tendency of treating expansions as self-contained stories… even when they maybe shouldn’t be. Practically every expansion has left tantalizing story threads dangling, characters abandoned. And that’s a shame, because Blizzard has created some fascinating places and interesting characters that we’re (seemingly) never going to see again. Though Mists of Pandaria often gets a bad rap for its frustrating Garrosh story and its ridiculously long content lull, it was a pretty dang good expansion. Pandaria itself was a lush, beautiful, detailed world, full of interesting characters who have just faded into the background. But the Pandaren, in particular, offer some very unique story possibilities. You have some percentage of them who remained neutral, stayed home on Pandaria, and would have plenty of reasons for hating both the Horde and Alliance. Certainly after we showed up and wrecked the continent, they may not have no interest at all in getting involved again. But then what about the Pandaren who decided to join the Alliance or the Horde? How do they feel about the conflict? Do they really want to fight one another? Do they regret their decisions? I don’t think we’ll get serious answers to those questions, though. Blizzard is looking forward to new stories, new adventures — focusing on Pandaren would be going back to old stories. Q4TQ: The Hivemind is cool and all, and I do intend to get it in the near future, but I always wanted a 5-player ground mount, ever since Cataclysm showed us the carriages in Gilneas and EPL. If you could get another multi-player mount, what would it be? Q4tQ: Is Azshara overrated as a villain? I mean, her most well-known moment is being played by a couple of teenagers, and then much later, sending out her minions to fail against the heroes of Azeroth. Precisely what has she succeeded at? We haven’t seen a ton of her in World of Warcraft, but she’s an incredibly powerful figure in the game’s lore. She managed to — however briefly — hold back the Sundering. This is not a person to be trifled with. But while we’ve encountered plenty of Azshara’s Naga followers, we haven’t had a full-on confrontation with her specifically. We don’t know what her goals are, or what kind of power she’s been building under the sea. What we do know is that she’s powerful and cunning… and unless our interests are aligned (which they probably aren’t), that makes her dangerous. Until we know just what she’s trying to do, though, we won’t know how dangerous. However, I definitely think she’s a credible threat, despite the many question marks surrounding her at present. And that’s all for today. Tune in again tomorrow for another Queue, same time, same channel.